The first spacecraft designed to detect light rain and snowfall from space has now captured the first 3D images of precipitation on earth. Nasa and the Japan Aerospace Exploration Agency (Jaxa) have released the images captured by their newest earth-observing satellite, the Global Precipitation Measurement (GPM) Core Observatory. The satellite was launched into space Feb 27. The images show precipitation falling inside a cyclone over the northwest Pacific Ocean, approximately 1,000 miles east of Japan, March 10. 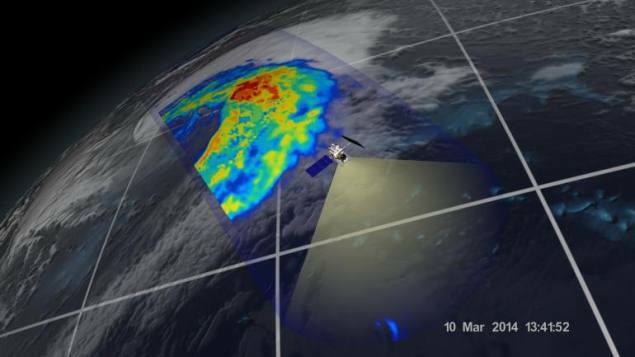 The data were collected by two different instruments of the satellite: Jaxa’s Dual-frequency Precipitation Radar (DPR), which imaged a three-dimensional cross-section of the storm; and, Nasa’s GPM Microwave Imager (GMI), which observed precipitation across a broad swath. Three colours show the rain rate. While red indicates heavy rainfall yellow and blue indicate low intensity in rainfall. “I knew we had entered a new era in measuring precipitation from space,” said project scientist Gail Skofronick-Jackson, at Nasa’s Goddard Spaceflight Centre. All this new information comes together to help us better understand how fresh water moves through earth’s system and contributes to things like floods and droughts, Skofronick-Jackson added. Nasa recently created the biggest photo ever made of the moon, where if each pixel was two metres it would cover an area equal to more than one-quarter of the US. If one creates a complete printout at the standard 300 dots per inch (dpi), you need a square sheet of paper wider than a professional US football field and almost as long. To put it in perspective, the entire image measures 931,070 pixels square – nearly 867 billion pixels in total. The gigantic interactive Nasa image of the lunar north pole can help budding astronomers explore the moon like never before. Constructed from 10,581 pictures, the mosaic provides enough detail to see textures and subtle shading of lunar terrain.